The Big Wobble: 100,000 lightning bolts:1 months rain in 2 hours and a 4ft wall of water which ripped up roads as English village is turned into an "apocalypse"
100,000 lightning bolts:1 months rain in 2 hours and a 4ft wall of water which ripped up roads as English village is turned into an "apocalypse"
The BBC claim 100,000 strikes of lightning bolts struck the Southwest of England last night. Residents described the scene as like an "apocalypse"
Incredible amounts of rain, a months total in just a couple of hours causes a 4ft wall of water which ripped up roads and damaged 50 homes after freak thunderstorms strike along with more than a thousand lightning strikes hit a sleepy Cornwall village in the UK. Lightning storms have lashed the south-east of England, hours after a village in Cornwall was cut off by flash floods. A yellow weather warning was put in place for London and the south east, as forecasters warned of "frequent lightning". "Thunderstorms are moving towards the London area. Intense rain, gusty winds, hail and frequent lightning all possible," the Met Office tweeted in the evening. As the storm rolled in, the lightning strikes were soon trending on Twitter as users, including comedian Bill Bailey, shared dramatic images of the storm. Earlier in the day, the severe weather had battered the south-west of the country. 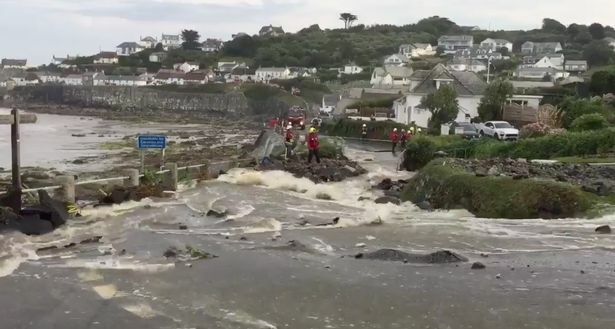 Fire crews raced to the small Cornish seaside town of Coverack amid "multiple reports of flooding" as ferocious thunderstorms moved over the area. Locals said say flash floods from "torrential downpours" in the storms had swamped homes and shops, while market stalls had been "swept away". Cornwall Fire and Rescue Service said its crews were attending "multiple flooding-related incidents" in the Coverack area. amid reports people were in "life-threatening situations" with all roads into the town, many on steep cliff inclines, deluged with water. It was also reported that a couple in their seventies were airlifted from their home as the flash floods hit. Residents described the scene as like an "apocalypse" and compared it to the devastation in Boscastle several years ago. Dozens of lightning strikes were captured on camera as hail and torrential rain battered parts of the West country late on Tuesday as summer was rudely interrupted. At Nare on the south Cornwall coast, 50mm of rain fell in an hour and there were 32 knots of gusting winds. Reports suggested some people were trapped in flooded homes and vehicles may have been swept off the road by the torrential rain. Wendy Davies, who lives in Coverack, said her garden was destroyed but feared many others had lost everything and described it as a scene out of a disaster movie. Police appealed to people not to approach the area. A Met Office spokesman said that by 7.30pm, the worst of the weather had already passed over Cornwall and moved over the Irish Sea. Hampshire was also experiencing some heavy storms on Tuesday evening, some of which were likely to affect parts of Wales. The spokesman said the storms would pass over quite quickly. "In Cornwall, the steepness of the area and the hills has enhanced the impact," he added. The Met Office issued a yellow, severe weather alert that was due to last from 4pm until just before midnight, warning there could be localised flooding. The thundery conditions are expected to move north overnight and the weather warning transfers to large swathes of the country north of the M4 on Wednesday. The Met Office said "Thundery showers are expected to push north across southern parts of the UK through Tuesday evening, perhaps turning more widespread towards midnight. "Although many places won't see these showers, there is a chance of localised flooding of homes, businesses and susceptible roads."